Public budgets follow rules of presentation and use terms that make sense to few outside the world of public finance. Moreover, practices vary widely among the thousands of governments across the globe, between federal, state, and local levels of government in the U.S., and among non-profit organizations, many of which provide services similar to governments. Understanding Government Budgets, Second Edition offers a detailed examination of each of the different types of information found in budgets, featuring annotated examples from a variety of organizations. It expands on explanations in the previous edition by including a wealth of examples from governments abroad and from the non-profit sector. The book stresses that the choices made about content, format, and organization influence the story a budget tells. Designed to help citizens, students, and policy makers become more informed users of public budgets, this book makes the format of budgets and the information they contain accessible and understandable, providing users with the tools they need to make better sense of public organizations and their performance. 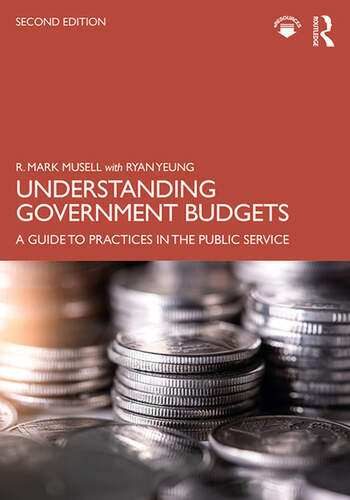 Perfect for undergraduate or graduate level courses in budgeting and public administration, Understanding Government Budgets, Second Edition also offers a useful guide to budgets for the average citizen with an interest in how government operates. R. Mark Musell is the books principal author. For ten years he was the director of the master’s program in public administration at the City College of New York where he taught courses in public budgeting and finance. He spent 25 years at the Congressional Budget Office studying the federal budget and providing members of Congress and their staff with budgetary information and analysis. Ryan Yeung is an assistant professor of urban policy and planning at Hunter College, where he teaches courses in budgeting and financial management, policy analysis, policy process, program evaluation, and education policy. He has a Ph.D. in public administration and policy from Syracuse University’s Maxwell School of Citizenship and Public Affairs, a Master of Public Administration from New York University’s Robert F. Wagner Graduate School of Public Service and a Bachelor of Arts in Economics and American Studies from Amherst College.